Discussion in 'Other Makes & Models' started by stilletto, Sep 22, 2016. Didn't own the FB6 for too long before coming across a great deal on a MK7. 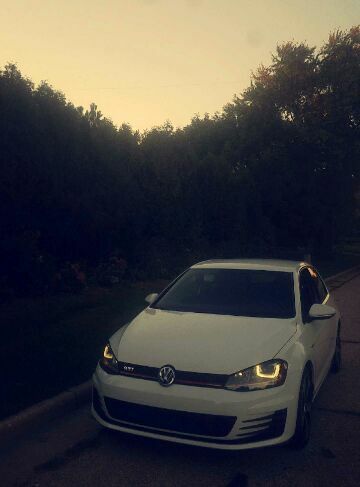 Picked up a 2016 VW GTI S w/Lighting. Signed then drove straight to another dealership that supported APR Tunes and Products. 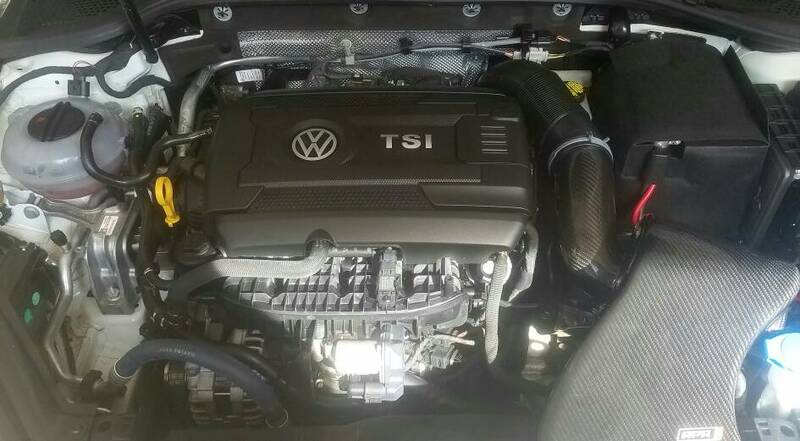 Flashed to an APR High Output map and purchased their Carbonio Intake. Installed it that night. This thing is a blast. Superior to every car I've owned, in almost every aspect. It's been alimos two weeks now and I continue finding new things to play with. Stage 1 is surprisingly fast for a little Volkswagen. These cars are underrated at 210hp and APR claims 291whp/367wtq with their Stage 1 High Output map on 93oct. It's already as fast, if not faster, as my previous Evo X. The only downside is the clutch slipping due to the ridiculous amount of torque. Only options right now are switching to a Low Output map (262whp/315wtq) or replacing the clutch. I'm leaning towards the latter since I plan on going Stage 2 next year. Nothing special, but here's a couple pictures. Dar-Dar, Sarcras, bigmitch and 3 others like this. Probably more if he didn't opt for the performance package. Wheels spin regardless. LSD ain't doing nothing when you're putting down 400wtq. Haha. Tune was $699 plus $100 Install. Intake was $449. Pricey, but Stage 2 is free with purchase of their Downpipe. Recently installed one of these 3D Printed Phone Docks by D-Docks. Things are impossible to come by so I'm pretty happy I was able to grab one. Only problem is I switched back to an iPhone yesterday and need to replace the cable now. Still weighing options on clutches right now. It sure doesn't help that an unmolested '96 TSI AWD popped up a few hours from here. Really fought myself yesterday. Only problem is I switched back to an iPhone yesterday and need to replace the cable now. Not a fan? Was gonna' order a Pixel but the iPhone 7 nearly doubled its score during benchmark testing. Those are some crazy numbers for just an intake and tune. Congrats man. bootyluvr, r18-power and bigmitch like this. Unicorn sighted in Crown Point, IN. '95 Eclipse GSX w/87k. Two Owner. Leather. No Sunroof. Automatic. STOCK! ..I need to stop spending money. bigmitch, webby and Nix like this. It got an AT, don't do it! Too much work, pain to swap, there's no more good transmission to buy, it suffered crank walk, etc... save your money. Sound about right? Old school DSM'ers have been switching to autos for the past few years. Guess people are getting these things to go 10's on stock transmissions. Jeez. The engine was recently rebuilt by the current owner. ..who happens to own a DSM Shop himself. Haha. Well, crap. Then I guess it's good to go isn't it? hahaha. You should buy a Starion instead. Driving up tomorrow morning. We'll see. The guy who helped me build the engine for my project car has a 95 eclipse that he is working on the 4wd conversion and a bigger turbo. Before his transmission literally exploded he was making about 350whp and it was a blast to ride in.